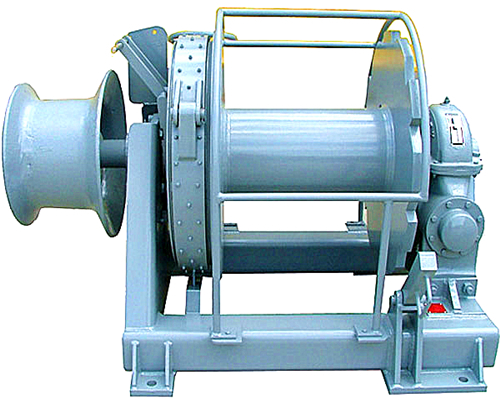 The endless rope conveyor winch is a kind of mine auxiliary transportation equipment. 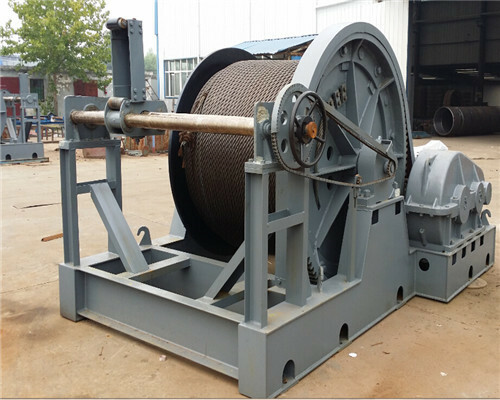 It uses wire rope to work round and round to realize the transportation function of the underground working equipment. 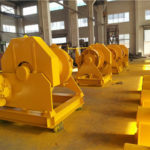 Because of its advantages of convenient installation, simple operation, low investment, low cost, long transportation distance and continuity of transportation, it plays a very important role in the coal mine production as the main transport or auxiliary transportation equipment. 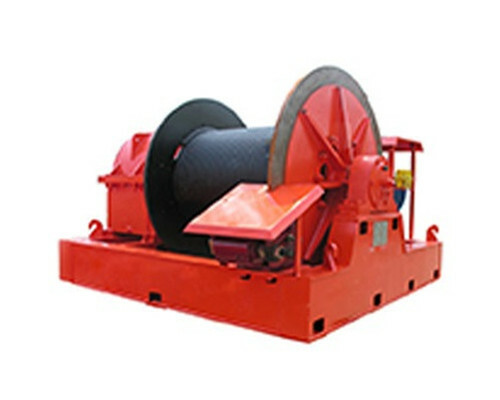 However, most of the Endless Rope Winches used in coal mines are still at the level of the 50s and 60s, with small traction, simple functions, small power and low efficiency. 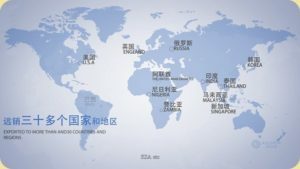 Although some coal mines have carried out technical transformation, they still can not meet the needs of current mine development and production. 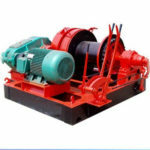 In this case, a new type of endless rope winch is designed. 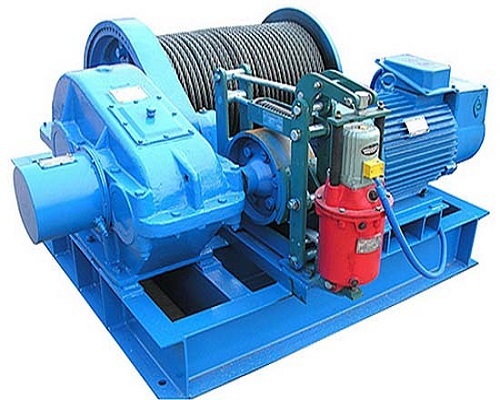 The endless rope conveyor winch structure is composed of motor, coupling, electro-hydraulic brake, transmission, manual brake, roller device, and base. The base is welded by the channel steel. 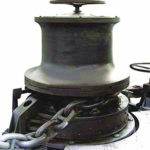 The motor, transmission and drum device are fixed on the base by bolts. 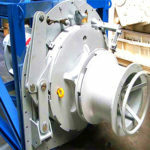 The brake steel belt of the 2 manual brake is respectively held with the brake wheel and the internal gear, and the brake handle and the brake block are welded to the base. 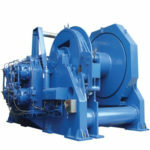 When working, the motor passes the power to the transmission through the coupling, and the output gear of the transmission meshes with the big gear ring on the drum to drive the operation of the drum. (1) the overall layout is reasonable, the structure is novel and compact, the volume is small, the occupied area is few, and the power input direction is perpendicular to the roller shaft. It can realize two-way operation, continuous transportation, long-distance transportation and high efficiency. 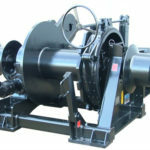 (2) the winch uses a new type of transmission, which is ingenious. The transmission has double functions of deceleration and braking, the structure is basically symmetrical, the appearance is beautiful and generous, the layout of internal parts is reasonable and the structure is tight. The output of the gear transmission is different from that of the previous axle output. 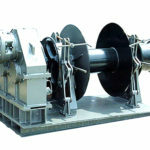 Thus, a connecting device to a transmission output shaft and a roller shaft can be reduced, and the transmission link can be reduced. 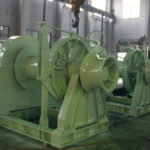 The gear meshing transmission is adopted, and the transmission efficiency is high. 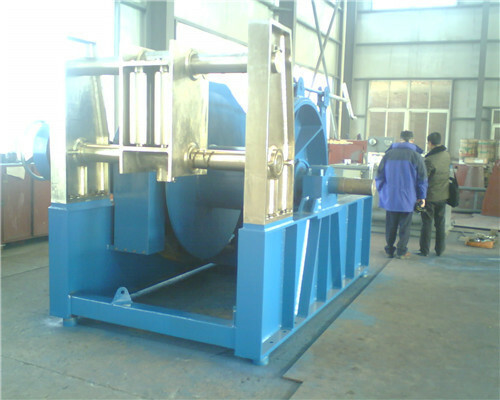 It is a new type of reducer with high efficiency, large speed ratio and large load capacity. (3) increased manual braking function and its safety and reliability have also been greatly improved. The braking device is arranged in the intermediate link of the transmission. The speed of the inner gear of the brake wheel and the planetary transmission is relatively high. Compared with the brake wheel and the drum, the required braking force is greatly reduced. The specific reduction is related to the transmission ratio of the last gear meshing, and the diameter of the brake wheel is also changed. Small。 In this way, the braking function can be realized with smaller braking force, and the operation safety and reliability can be enhanced. At the same time, due to the smaller braking force, the brake belt also has a smaller force, less wear and longer service life. 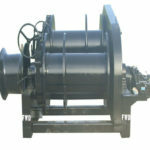 The brake handle device is located at the tail part of the winch, and the operation is simple and convenient. (4) the structure of the roller is symmetrical, supported by a pair of self-aligning roller bearings on the roller shaft, supporting effect is good, supporting rigidity is high, and the operation is stable. And the spindle is the axis of the heart, does not bear the dynamic load so that the strength and stiffness of the shaft demand are greatly reduced, so it can reduce the process link, save material, reduce cost. (5) the structure of the roller is symmetrical, supported by a pair of self-aligning roller bearings on the roller shaft, supporting effect is good, supporting rigidity is high, and the operation is stable. And the spindle is the axis of the heart, does not bear the dynamic load, so that the strength and stiffness of the shaft demand is greatly reduced, so it can reduce the process link, save material, reduce cost.